Lorna Maher is from County Wexford. She is from a family of musicians and started playing tin whistle at age 4. Her love of music was nurtured in a local marching band but progressed to playing in various ceili bands and folk groups. She is a multi-instrumentalist and studied music for Leaving Certificate. Lorna completed her BA music degree in Waterford I.T. studying composition, voice, piano and piano accordion. She also attained her teaching diploma in traditional Irish music (TTCT) with Comholtas Ceoltoiri Eireann. Lorna studied piano and completed to grade 8 with Marion Ingoldsby and her accordion tutors included Liam Gaul and Bobby Gardiner. During her time in Waterford she was also a member of the Waterford City Choir. Lorna has worked extensively in primary schools on choral and instrumental programmes and currently teaches music in Counties Wexford, Wicklow and Carlow. Lorna also works with choirs and adult groups; her latest project is Songs of Ireland for WWETB. Lorna joined Music Generation in 2014 and teaches their foundation and choral music programs. 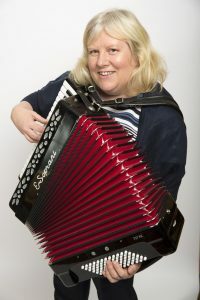 She also tutors their traditional music classes in Blessington and is involved in running their annual Summer Camp. She has always strived to make music assessable to all; and is delighted to be working with music generation to achieve this dream.